For mobile users on both touchscreen phones and tablets, Google Search has a new feature called Handwrite, a beta feature that can now be turned on in the settings section. 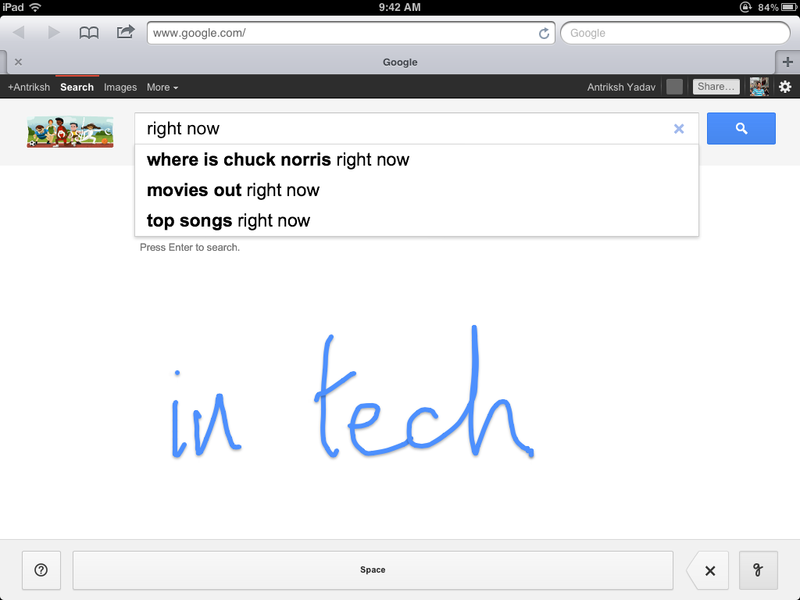 To enable Handwrite on your mobile device, go to www.google.com in the browser and enter settings. On the tablet interface, you can tap the cog button in the top right and tap "Search settings". On the phone interface, tap Settings on the home page. If you are on your mobile device right now, you can tap here. In the settings, there will be a new entry called Handwrite that you can enable. Be sure to save your settings after enabling it to make sure it works. Go to the Google search home page and tap the new Handwrite icon in the very bottom-right of the screen and write anywhere on the screen. When you stop momentarily, your handwriting is converted to text and entered into the search bar, also activating Google Instant. You can still continue writing anywhere or you can tap a suggestion or result whenever you like. Remember that Handwrite is still in beta and it may not work very well at the moment. Google says that it works best with straight block letters. They also say that this feature is meant to complement, rather than replace typing. It is currently available in 27 different languages and works on Android and iOS. Learn more about Handwrite on its own page or on the Official Google Blog. I predict that Handwrite will surely get to Google's mobile apps at some point as well. Let's see how long the beta tag stays on.